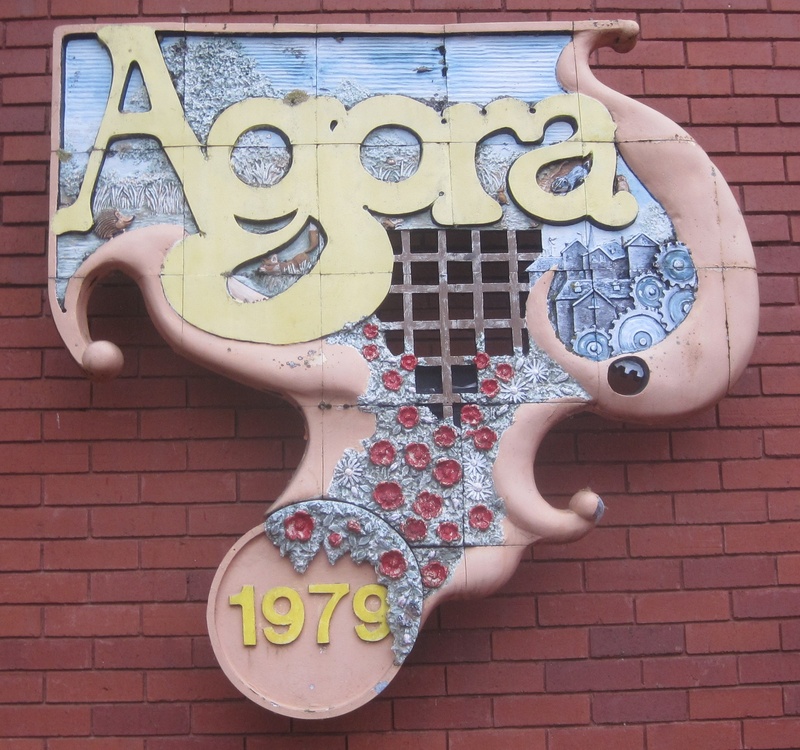 The Agora is one of the most controversial buildings in Wolverton. It was designed and built by the Milton Keynes Development Corporation in the mid seventies. It was intended to be a central meeting point for commercial, social and sporting activities. The idea, I believe, originated from the Wolverton Council who decided that the area to the north of the Market Square should be developed together with much of the land to the south of Church Street and around what is now Glynn Square. A design team was set up in the MKDC Northern Towns Group to investigate the idea further. The area was surveyed and zoned. Early decisions were to build large retail and service units in the Glynn Square area and some form of multi-use commercial/social building at the top of Market Square. For inspiration, a the team visited a town in the Netherlands, where they had built an Agora which was a large building with a large hall which could be used as a market, sports hall, dance hall and general meeting hall. In addition it had a cafe, a restaurant and other facilities. It appeared very popular and successful. On our return, we investigated a number of forms including a circular building. This was difficult to roof and dispose of the rainwater. A rectangular hall with shops and offices each side gave difficulties with levels. A square hall with the shops and offices on four sides was adopted as the solution and it was decided to rotate it so that the diagonal axis was on the centreline of the old market square to try and encourage pedestrian through routes. Red brickwork was proposed for all the major walls in keeping with Wolverton and it was hoped to cover the hall, which was 120 feet square, with a spectacular space frame with plenty of roof-lights. Unfortunately, about that time, there was a serious fire in a leisure centre in Douglas, IoM where a similar roof collapsed with loss of life. So this was abandoned and a heavy steel lattice girder frame employed instead with no roof-lights. The roof was constructed at ground level and hoisted into place on columns in one piece. An exciting event! The brick built structures were then erected. The building was completed in 1979. By that time I had departed for Hong Kong. I understand it was used for its intended purpose for a few years but never really realised its potential nor was a financial success. This entry was posted in Archive, Living Archive, Milton Keynes, Places, Wolverton and tagged Agora, Milton Keynes, Milton Keynes Development Corporation, MKDC, Multi purpose Buildings, Wolverton. Bookmark the permalink.